Should you walk into my house, you would notice a lot of things that have to do with Arlynne there. It has become a case of “if I can’t have her around then I want her stuff”. An outsider might not be able to understand but it is just the way it is. While we haven’t created a shrine for her there are things we keep around that remind us of her. One of the things I love is this photo of her. It was the photo on the front of the newspaper that announced her accident and death. It hangs above my bed, along with a picture of the butterfly that God sent to remind us of His grace in the aftermath (see blog entitled “Reminders of Grace”). I don’t look at it every day. Sometimes it is just too painful. But I know it is there. Her beautiful face with that smile. I love the whiteboard from her bedroom. All I have to do is look at it to be reminded of the person that she was. 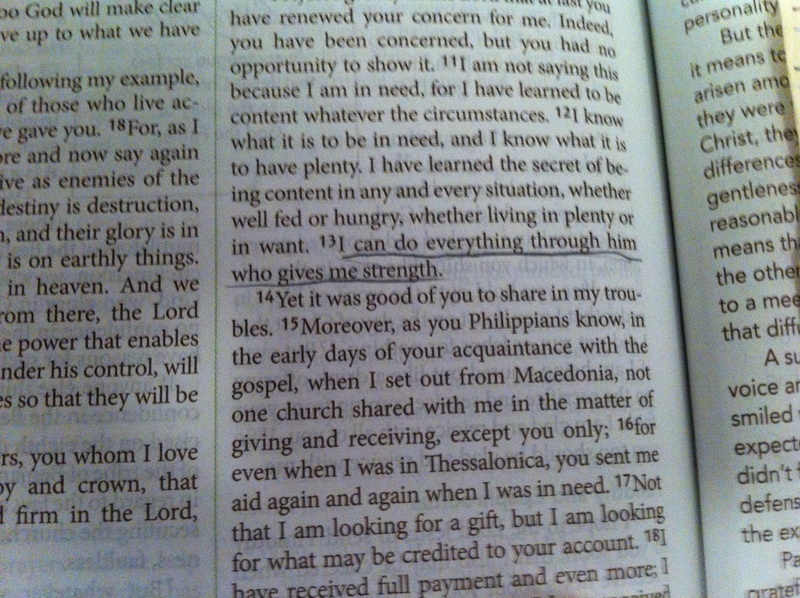 The Bible verse that she drew strength from. The note from her mentor. 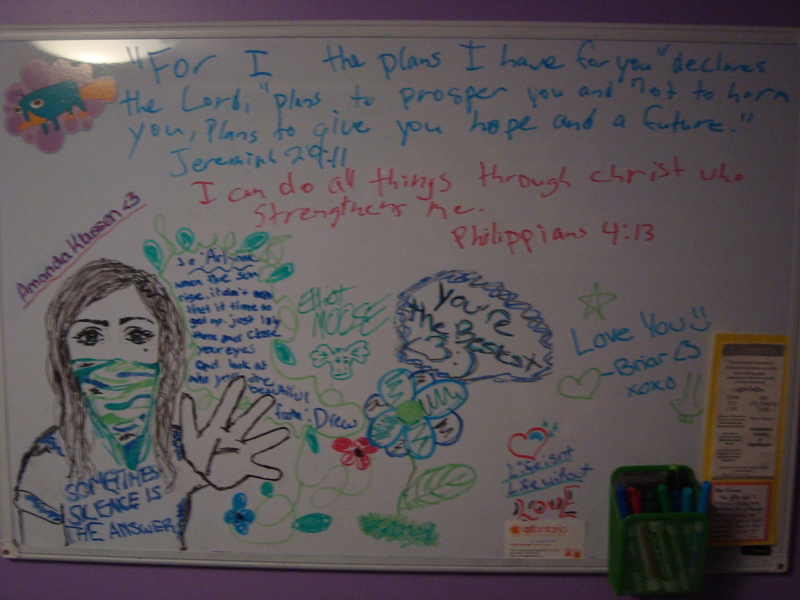 Her whiteboard hung in her room until we moved Josiah into it. I could come in and see the messages her friends left her. She was loved. Not only by me. They have gone on and some have moved away. I miss them still, this group of kids. Not as much as I miss her but they are definitely connected. Arlynne and her friends. 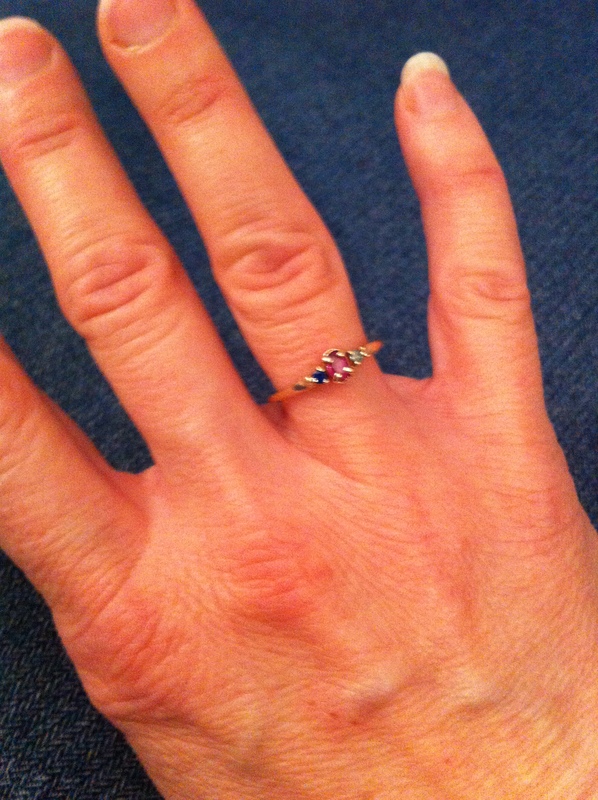 When Karissa turned 16 years old, Pete and I bought her a birthstone ring. Arlynne was not going to be with us for her 16th birthday but she and I went to the jewellery stone together and she picked one out. This ring told the story of her love not only for me but also for Pete. We ordered it and it arrived after she had left. It was still at the store when we found out that Arlynne had died and Pete went right away and got that ring. I had to wear it. It is too big for my finger but I can’t bear the thought of not having it for the length of time it would take to size it. I wear another ring on the same finger so Arlynne’s ring won’t slip off. I think of her every time I look at it. Arlynne attended an alternate high school so she wore uniforms to school. She had very few other clothes. Mostly an assortment of t-shirts and jeans along with her more extensive summer wardrobe. Though I would never have admitted it to her when she was alive, I am so glad that she was almost the same size as me. I don’t wear her ripped cropped jeans but there are a couple of her shirts that I often wear. My favourite is a long-sleeved Campus Crew hooded t-shirt that she and I picked out together. I was glad when it got cool enough outside for me to wear it and it always makes me feel closer to her. She also had a purple hoody that Karissa and I both wanted. It doesn’t fit Karissa but she took it with her and hung it in her closet while she lived in the dorm at university. It is Arlynnne’s favourite colour and I think it makes Karissa think of her. It isn’t with Karissa at school now, it is hanging in her closet, but I like to think that Karissa treasures it. Eden is now wearing a number of Arlynne’s t-shirts. Arlynne’s high school was named “Eden” so it is amusing to see Eden wearing an Eden shirt. Eden has also taken a few of the shirts and sealed them in a plastic zip-lock bag so that they don’t lose the scent of Arlynne. Sentiment runs deep around here. One of things that I have that you can’t see around my house but I still cherish is the video that the church made for her baptism. It is a testament to God working in her life but it is also a way for me to audibly hear her voice. Josiah recently acquired his oldest sister’s old iPhone and he had to have the video installed onto it. I haven’t watched it in ages but the sound of her voice made my heart skip. I don’t think I will ever forget that voice. I hope it is the same when I finally, finally get to see her again. Heaven is not soon enough. 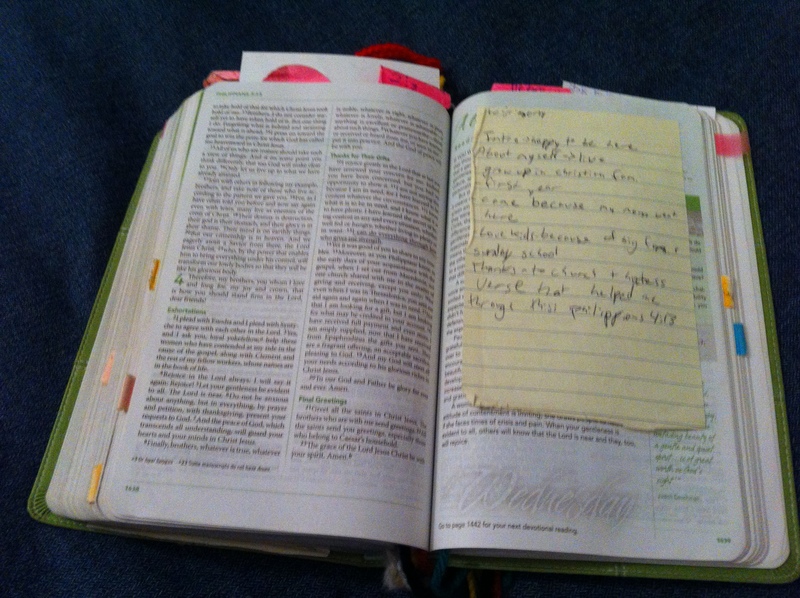 Everything that she left here was precious but the one thing I cherish the most is her Bible. 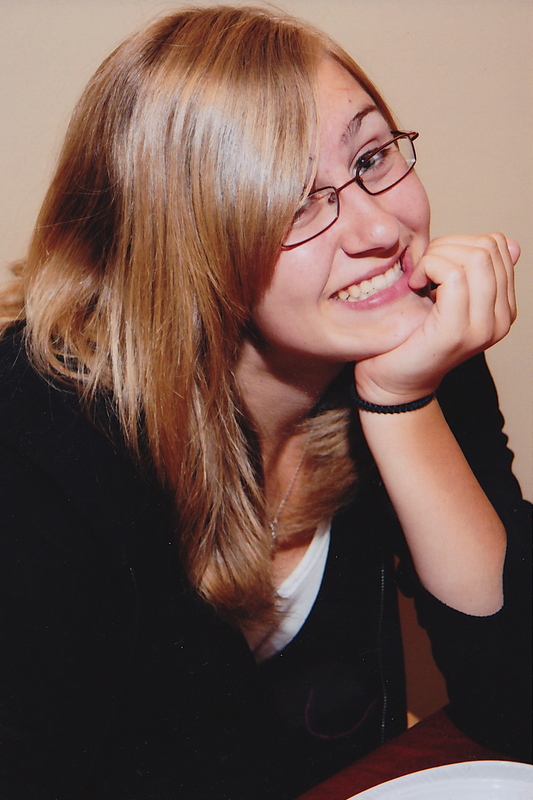 She and I went to buy it together before her missions trip to Montreal in the summer of 2010. It was in her suitcase when it made the long, last journey home. It is special, not only that it is the Word of God but it was one of her prized possessions. It is the first Bible I grab when I am going out to Bible study. It looks well-used, loved. And it is. 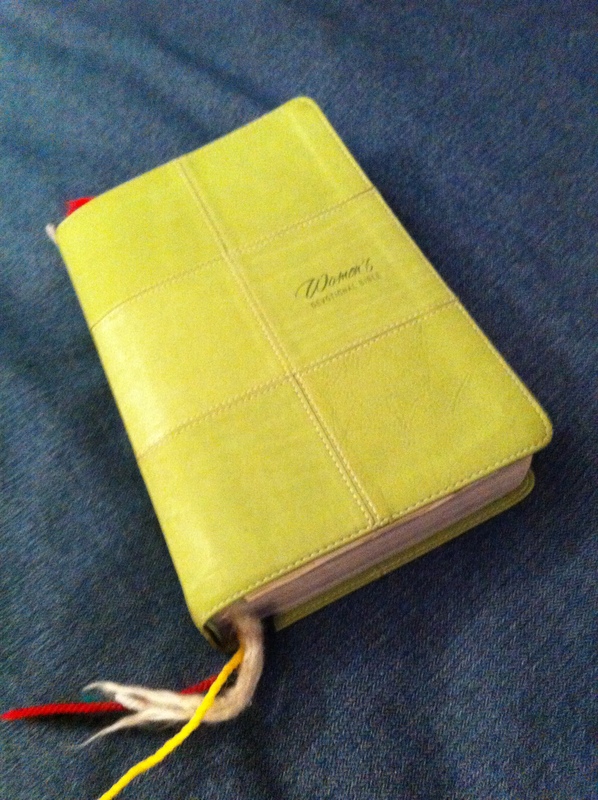 It is filled with yarn bookmarks and post-it notes for the Bible stories she taught that last summer. It also contains the notes that she used to tell the kids in her groups about herself. The writing is messy. Hers always was. I can make out how happy she was to serve. And she talks about me, her mom, and how I had been in the same mission, teaching kids, 25(!) years before. She was walking in a legacy she felt her mom had started. One of the most precious things about her Bible is the evidence of her journey through it. I am constantly surprised to find another underlined verse in her wobbly hand. It shows where her heart was. What she thought about. How God was leading her. It shows me that she treasured it and she was using the truth that it contained to change her. As time has passed and I have spent time in her Bible, it is changing. Not only does it reflect the journey she was on, it now reflects mine too. Being in it almost daily, underlining passages that have spoken of God’s faithfulness to me it illustrates the ways that He has revealed Himself to me. Proven His faithfulness. Exhibited His grace. Her Bible now not only tells God’s love story to us but it tells the story of a daughter and her mother who have walked in it. Her Bible may last until I am gone. Then it could go on to show another person God’s story of grace and its effect on 2 lives. A legacy of faith. I wish that I didn’t have to treasure these objects. I wish that she was still here, with me, alive. I know, though, that she is more alive than she has ever been. Our separation may hurt but it is temporary. I have things to hold onto but I also have a Heavenly Father who holds me. I would miss some of these things if they were gone but they are just that. Things. I won’t take them with me. Arlynne left them when she left and so will I.